I first learned about Nina Evans Allender while watching a PBS special about the women’s suffrage movement. The episode was set at the Sewall-Belmont House and Museum in Washington D.C., the headquarters for the National Woman’s Party. The entire episode was riveting, but I really sat up and paid attention when they mentioned that Allender was the main illustrator for the movement. This led me to do some independent research because I wanted to see more of her work and learn about her involvement with the movement. I decided to compose this blog post based on the information I found. Most of the content covered in this blog post came from the Sewall-Belmont House archives and Wikipedia. 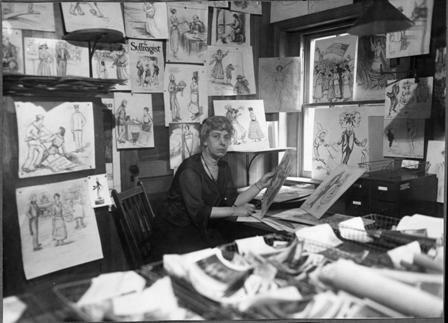 #1 Nina Evans Allender was an American artist, cartoonist, and women’s rights activist (December 25, 1873 – April 2, 1957). #2 Allender studied art with William Merrit Chase, a famed American Painter and founder of the Chase School (which would later become known as Parsons The New School for Design). #3 Allender considered herself a painter, but Alice Paul convinced her to try drawing. 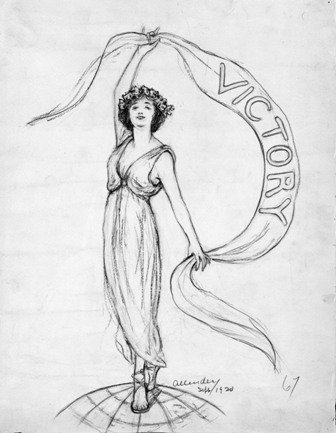 She wanted her to create illustrations for the suffrage paper known as The Suffragist. 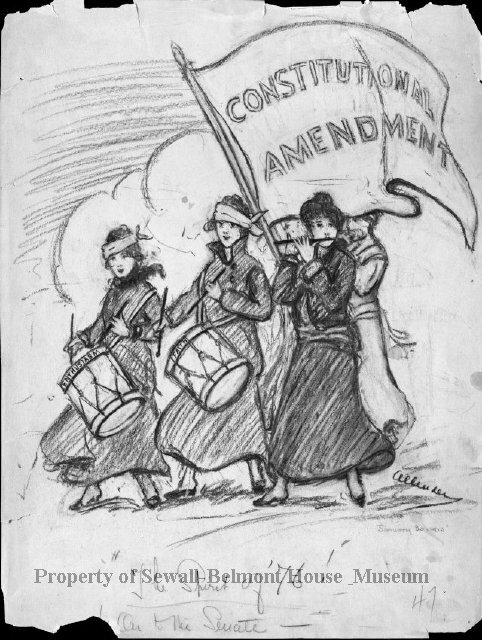 #4 After Allender began drawing for the paper, she was quickly elevated to the role of the official cartoonist for the National Woman’s Party. She is known for creating the “Allender Girl”, a young woman who was portrayed as being capable, stylish, dedicated , and attractive (the previous portrayals of the suffragettes were less than ideal). 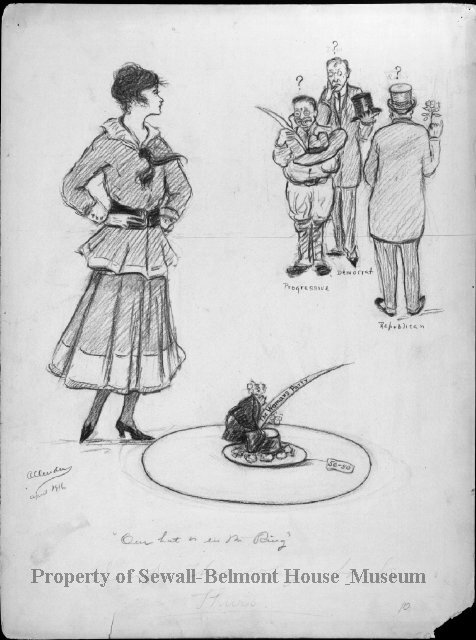 During the course of her career, she contributed 297 political cartoons to The Suffragist newspaper, and changed the way that women were perceived going forward. #5 Allender sued her husband, Charles, for a divorce in January 1905 after he ran off with another woman, and she won. This was unprecedented for that time period. Women did not get divorces (the horror), and they certainly didn’t try to sue their husbands (the scandal). #6 Allender was president of the District of Columbia Woman’s Suffrage Association in 1912 and president of the Stanton Suffrage Club in 1913. #7 Allender studied abroad in Spain and London for several years before returning to Washington, D.C.
#8 Allender designed the “Jailed for Freedom” pin, which was bestowed on women jailed for campaigning and picketing for the cause. 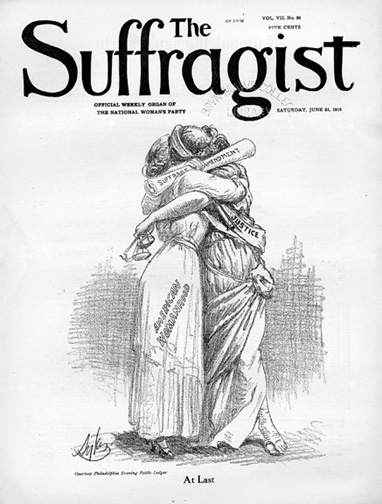 #9 The cover of the September 1, 1920 issue of The Suffragist featured Allender’s Victory to announce to the world that women attained the right to vote. Many women fought long and hard to attain this right, so I can only imagine how elated they must have been. In honor of Women’s History Month and to gain a better understanding of our shared history, the website for the National Woman’s Party is definitely worth checking out in its entirety. I am in awe of the sacrifices these women made to give us a right that we now take for granted. Whenever I need to remember how important it is to exercise my right to vote, I only need to look at information like this to put me on the right track. Great article. I’ve read other articles about the suffragette movements and some of the things they had to go through… it’s unthinkable today. And still we should remember what they did, because today we take it for granted and that’s never a good thing.